"3LA1, V-1133" by Timothy K. Perttula and Robert Z. Selden Jr. CONTEXT INFORMATION: This vessel, along with 18 other vessels, came from a grave exposed in June 1934 during plowing by Dan Jenkins from his potato patch. The other vessels found include V-1123 to V-1136 as well as sherds from four vessels (V-159 to V-162). According to Mr. Jenkins, some of the vessels were found around the head of the individual, with the remainder at the feet. DECORATION: The top of the bottle body has six horizontal engraved lines that are bisected by three sets of three vertical appliqued ridges; one set is not as long as the others. A similar Friendship Engraved bottle has been documented from a burial at the Wm. Handy Place. 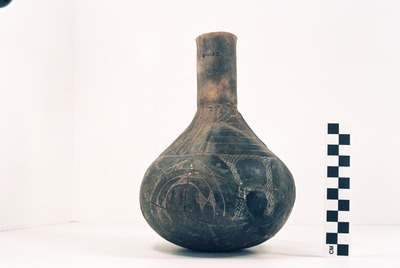 The lower part of the body has three sets of narrow concentric engraved zones underneath the upper body appliqued ridges, each partially filled with hatched or cross-hatched areas; one of the two concentric engraved zones in each set has a cross-hatched element that closely resembles the decoration seen on the bodies of engraved canebrake rattlesnake Caddo bottles (Walters 2006). The lower concentric element encircles three short vertical appliqued ridges. On either side of the central engraved-appliqued motifs on the lower body are three rectilinear cross-hatched engraved zones with either negative ovals or negative S-shaped areas.